Ici was my first encounter with Jérôme Thomas, a huge name in circus and new juggling, and it felt as though I'd come too late – that he's an artist who's climbed so high that he's cleared gravity and turns slowly now through outer space, intent on the stars. How can you communicate something which doesn't itself communicate? It starts in darkness, two shapes part-visible under a sheet of think, clear plastic held up and lit blurrily from within by anglepoise lamps. The two figures are at a metal table pushing objects back and forth, the sound amplified to a thunderous grind and clatter; as the plastic sheet comes off we see it is two men, with long false noses, dressed all in white, using simple cutlery to scrape up and manipulate a green non-Newtonian fluid that shifts between liquid and solid, spilling over the edge of the tabletop like paint at one moment, in the next becoming malleable putty as it is briskly gathered with strokes of a knife. They square the substance away, and begin a series of looped actions – polishing and passing cutlery, wrapping and passing nondescript parcels – short loops with many repetitions and slow deviation. To the onlooker it is half a lab experiment, half a cafeteria staffed by insane witches – grotesque in the sense of unnatural, and suffused with a claustrophobic nastiness that rises until the two attack each other by dragging forks hard across the metal tabletop (and remember all table sounds are being amplified), some members of the audience going so far as to cover their ears, everybody suffering. It's tedious and unpleasant, and later scenes, though different in tone, exhibit the same self-involvement. 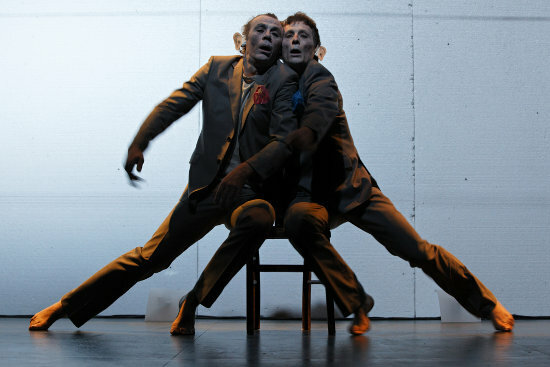 The two men, dewitched, seated at opposite ends of the stage in bright light, wearing now for whatever reason false ears, turn infinitesimally slowly to face each other. A kind of Meccano music box (Pierre Bastien's rhythm sculpture) sits at the front of the stage as the two walk in circles and draw thin plastic behind them – lambent, watery, almost as light as air; it's beautiful in its way, but Ici isn't interested in that. Each simple theatrical effect is repeated until it ceases to be that – an effect – and turns instead to a grating nonsensical cipher: after the slow build of the seated scene (which progresses to a lying down scene where the two are blown by a very, very gradually intensifying invisible wind), the first in a line of ground-lights switches on, a fan blows a tongue of paper up behind it, and a single, clear note sounds for a second; then the next light, then the next. It's pleasingly weird as it moves down the row and up the scale, and the paper casts a wavering shadow like the silhouette of a flame, but when it reaches the end of the line of lights, it loops and the scale starts again – and it goes on and on. With Ici this is the way of things. I became very aware of time, and the time I was spending, and how my resources of it were limited. I wanted to be somewhere else. I wouldn't call it pretentious, for all that it might seem that. I think probably Thomas has a genuine and deep fascination for the separated elements of his art – for the formal workings of rhythm, patterning, scale, depth, texture – but I think as well that it's reasonable to question whether that interest includes attention to the nature of its performance, and care for the state of the audience. Another way to put it: he is not looking back. And while pushing far past the safe zone of regular human patience can be a productive means of discovery and exploration, it seems to me that in pursuing an idea to its furthest end sometimes you will uncover something true and forgotten, and other times – many times – you will come back empty-handed. Where is Jérôme Thomas, and what has he found there? For more on Jérôme Thomas see his interview in Stradda magazine and his profile in the book Panorama contemporain des arts du cirque. His company is also featured on the double-DVD compilation Le Nuancier du Cirque.